As I mentioned last night, I found a cool article on the Shape website that had 20 of the “Best Ab Exercises of All Time” and I was instantly intrigued. (You can find it here if you’re interested!) So late last night as I was waiting for my sister to arrive (yay!) 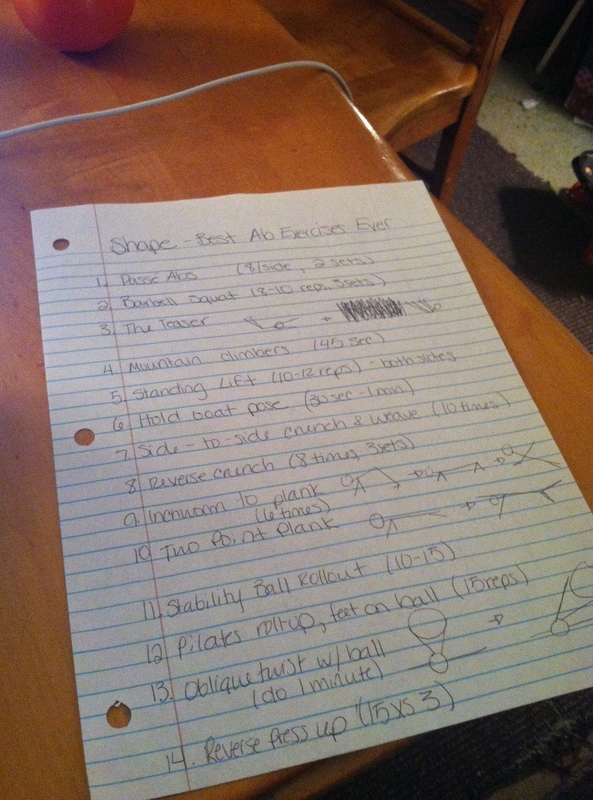 I copied down the exercises and planned to take them to the gym with me this morning. I didn’t end up doing each move and definitely didn’t do three reps of each, but I’m excited to try it again soon! Now, for some serious business. I am currently trying to determine whether or not the fact that my active heart rate/ heart rate when exercising seems to be quite high. I’m not too terribly concerned as I know my resting heart rate is perfectly normal, actually even better than normal, but I’m still puzzled! I’ve always known about the whole “Target Heart Rate” equation (thank you, high school P.E. ), and I also found a bunch of things online about heart rate, but who KNOWS how factual that stuff is. Also, you can only put so much stock in those nifty heart-rate monitors that are built in on cardio machines. I’m hoping that I’m just one of those random people whose heart rate jumps during exercise, but somehow remains perfectly normal at rest. If not, we’ve got trouble in paradise. I suppose I’ll just keep an eye on it for now! The good news is, I never ever feel like I’m on the brink of death when I workout and it always goes back to normal very, very quickly. Anyway, today was filled with lots of running around and traveling, so not much to update for now. So TTFN and I’ll see you tomorrow! This entry was posted in Ab Exercises and tagged Ab Workouts, Heart Rate by 5ksandcoffeebeans. Bookmark the permalink.